John Tompkins has passed on the sad news that Brian Corbin died at Wexham Park hospital on Monday 30th January. His daughter Kate Solomon was with him, and we also have a request from her. 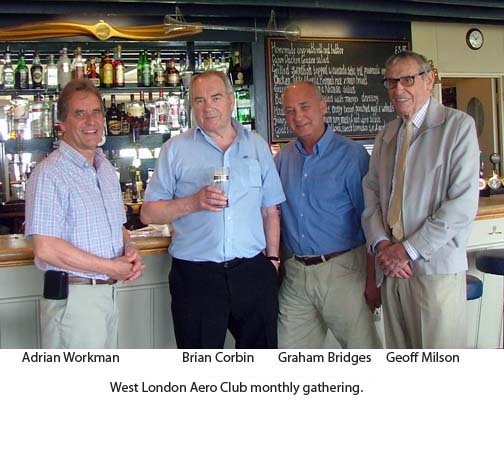 This is probably the best photograph we have of Brian, at the West London Aero Club in 2012 with Adrian Workman, Graham Bridges and Geoff Milsom. daughter Kate was with him. Flying Club where he and other ‘Faireys’ met monthly. “I know how much the monthly visits to White Waltham meant to my dad and I believe you make many of the social arrangements for the Fairey Group. Braywick Cemetery, Braywick Road, Maidenhead SL6 1DJ for 2pm. Back to White Waltham for a buffet etc. It would be lovely for me to meet some of my Dad’s friends and to hear about his time at Fairey and Clyde Surveys, particularly as this is such a sad time. I know it is difficult but if you could gauge numbers that would be attending that would be great. Waltham have told me they can only cater for 50 and I haven’t a clue how many we should expect. Please let John Tompkins know if you would like to attend the wake at White Waltham, so they can cater for everyone. If you have a story or anecdote that you would like to share, but can’t attend the funeral or the wake, again please contact John, or post a comment here to share it with everyone. If you don’t have John’s contact details, email admin@faireysurveys.co.uk and we’ll pass on the information. This entry was posted in News/notices, Personnel and tagged Brian Corbin by admin. Bookmark the permalink.